Dr. Mario (Dr. マリオ, Dokutā Mario) is a puzzle video game made by Nintendo for the Nintendo Entertainment System and Game Boy video game systems, released in 1990. It is like the game Tetris. 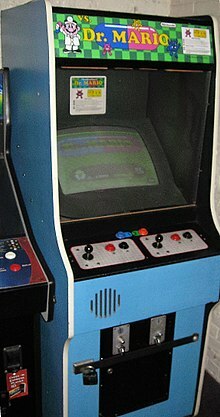 The gameplay of Dr. Mario is to make sure vitamins of the same color are lined-up together. There are three colors of vitamins (red, blue, yellow). The goal is to clear all the capsules without going to the top. The player can pick any default level from 0-20, with a set number of viruses to clear depending what level the player is on. The virus count goes as high as 84, and does not increase after you pass level 20. There are over 40 levels in the game. The player can also set up the skill level and music (Fever, Chill). Dr. Mario was rated the 134th best game made on a Nintendo System in Nintendo Power's Top 200 Games list. Dr. Mario was also rated by ScrewAttack as the seventh best Mario game of all time. Overall, Dr. Mario has scored a press average of 7.6 on GameStats. ↑ "NP Top 200", Nintendo Power, 200, pp. 58–66, February 2006 .